There are times when one thoughtful act can change the way the world sees you – or the way you think it sees you – even if you are only seven years old and your world is a little smaller than it will one day be. I was still seven years old when the year turned to 1964. I observed the world as the youngest of three sisters, the third of four children. My viewpoint was inevitably coloured by their experiences. My oldest sister, the elder by seven and a quarter years, was practically a grown-up in my eyes. She knew about the Beatles and dancing and had a record player in her bedroom. She knew everything there was to know about the world I aspired to be a part of. She was fourteen going on twenty. Teenagers inhabited the world of pop songs and parties. Later, the girls would tease and back-comb their hair into imitation beehives, wear mini-skirts and flutter false eye lashes. They were an elite group and we all looked forward to being admitted to their circle. I still had a way to go at seven. My early experience of the sixties was one of realising that some people just ‘had it’ while others, like me, aspired to have it. There was a girl in my class who always wore the latest fashions and knew exactly what was what in the music world. Her name was Sharon. She was seven, like me but she could do the ‘Hippy Hippy Shake’ and more. She was there, shaking and twisting, at every birthday party we attended, her skirts billowing out around her. I longed to be like Sharon. Her blonde hair swirled as she danced and she wore her clothes with panache. Sharon was popular and the other girls flocked around her. At least, that’s how it seemed to me. In the Spring term of 1964, Sharon sported an above the knee, tailored, double-breasted coat with shiny brass buttons. I still wore the one passed down from my sister. Owing more to the long gone fifties than to Carnaby Street, it had always drawn my admiration for its tweed fullness. I loved it, caring nothing for the fact that it fell well below my knees, until Sharon and her friends laughed at it when I wore it to school. Sensing the need to save face, I shrugged. They stopped laughing and sympathised instead. Even Sharon had to do what her mother told her. Sharon was not really without feelings. The Spring term hurried on. I hovered on the stairs when my sister and her friend disappeared into her bedroom to listen to records. Mostly still content to play with my dolls and hang out with my baby brother, I was also intrigued by their giggles and whispered conversations. I received short shrift should I dare to peer through the doorway but I knew they practised the latest dances. I once asked my sister if she would teach me how to dance. She laughed at me and told me I just needed to move about a bit. She demonstrated a couple of moves. I tried them. I don’t think they went quite as well as I’d hoped. I practised the head shaking – alone. My hair was not as long as Sharon’s and nor was I blonde so I did not get quite the desired effect when I looked at myself in the mirror. I did get a pain in my neck and felt extremely queasy for a while. Perhaps dancing was not my forte after all. The Spring term ended and Easter approached. Winter clothes were put away and summer clothes brought out to air. My wardrobe was never extensive. Children just didn’t have the amount of clothes they have today, back then. I possessed some hand-me-down dresses from my sisters and my mother knitted us all a couple of cardigans. Invariably, these would include a pink and a white one for my middle sister and a blue and a white one for me. My mother was very busy over the Easter holiday. A Follower of Fashion in her own right, she made all our clothes and many of her own. They were all beautifully sewn. We were allowed to help choose the material and the dress patterns. This Easter, I had chosen a pale blue cotton and a pretty yellow and white floral print. The pattern book was not needed. 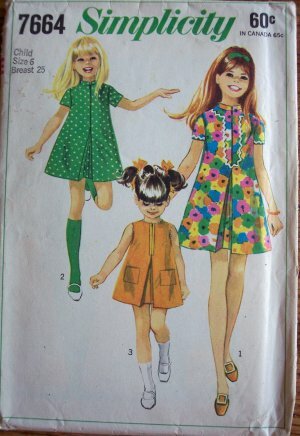 My mother already had the dress pattern she had used for my middle sister when she was seven. The dresses were lovely. Their skirts billowed out – a sash tied round the middle. I couldn’t wait to wear one to school. On the first day of the summer term, I chose the yellow and white print. I trotted off to school with my middle sister. I don’t recall what she wore. At ten years old, she barely spoke to me unless she had to. I walked into the classroom and the bright smile, that I had had pinned to my face all morning, vanished. My dress failed to draw the admiring stares I had hoped for. I could see why. The fashion powers that held sway, had decreed that young girls’ dresses grow slimmer and straight. Tailored styles had burst upon the scene. Sharon wore a simple shift dress with epaulets and pockets. I looked down at my billowing skirts and if the floor could have swallowed the seven year old me up, I’d have been happy. To be fair, no one said anything, they didn’t need to. Perhaps one or two girls still wore old style dresses but that did not help. I spent the day suffering from ‘wardrobe shame’. I don’t recall telling my mother what had happened. I hated the thought of telling her that the dress I had loved this morning was a fashion travesty by home time. Perhaps my sister, ever observant, said something. She had already moved up a notch in the pattern books. I merely asked my mother if next time, she could use a different pattern. She said that of course she would and that was that. I put the dress aside and wore another, less flouncy one the next day. Mothers are canny creatures. Mine was cannier than most. She must have guessed at my wardrobe-humiliation and a couple of days later, she took the brand new, crisp cotton dress with its carefully sewn skirts and wide sash and worked on it, unbeknown to me, into the small hours. The next morning, when I awoke, it was there. Gone were the fussy, flouncy skirts. This dress was straight ‘A’ line, sleeveless with no hint of a swirl. Best of all, it had a long zip running down the front with a silver ring pull on it, just like the ones in the magazines. I couldn’t wait to show it off, I couldn’t wait to thank my mother. I ran all the way to school wearing the re-vamped dress and I soaked up the admiring glances, both real and imagined, that were thrown my way as I walked into the classroom. Sharon came over and nodded approvingly. I basked in this new found celebrity. I wore the print dress to the birthday party we had been invited to the following week. I no longer worried that people would laugh at me. I no longer felt inferior to Sharon and her circle of friends. Over time my mother transformed all my dresses (there was so much material in each, it was easy she said). Along with my new wardrobe came a whole new confidence. I no longer worried that the dance moves I was performing fell short of those executed so deftly by Sharon. Clad in my new up to the minute clothes, I could do anything. Suddenly, back in 1964, I had it! How well I remember the fashions of the time. In 1964, the required part of the wardrobe was a pair of white go go boots like they wore on “Hullabaloo.” Very fashionable, but, and I can state this from personal experience, no good in the snow! In 1967, our family traveled to the UK and my sister and I were treated to lovely bright orange miniskirts at Kids in Gear on Carnaby Street! Can you imagine the looks we got back in our small town in Virginia? Slicker lipstick, Vidal Sassoon haircuts, bright colours…the 60s were a great era for fashion! Not so easy, I’m sure–a generous gift so you could be more confident and one of the It girls. Lucky you! Indeed Andrea, nothing is ever as easy as when it has been done! My mother passed down her skill to me. I made many of my own clothes and most of my children’s clothes for years. I was always very careful to check what was in fashion though before I started. I love this piece, Debbie! Not only does it distinctly conjure up a time, but it conveys the insecurities of youth so beautifully. I remember feeling that need to fit in — and to have the clothes that fit as well. How wonderful that she had the skills to make the changes. Clothes really do help define how we feel about ourselves. Wonderful story telling and I do so remember those days of changes. How sensitive and creative of your mum. My mum was a school teacher and only a seamstress by summer – and usually off somewhere my father was teaching summer school…We had 5 dresses for school and the church dress had to transfer to school the next year. My older sister learned to sew early – she made herself suits all the time – Like Jackie Kennedy. I could not get the hang of sewing – just the “swearing” part! My Mother took my older sister’s clothing and remade them for me…My sister was 5’4″ tall and very, very thin. I was 5″9″ and round and big. By 3rd grade I just had to be thankful I had clothing to put on so I could get to school…I ran into a school friend from 40 years ago and one of her questions over lunch was Why did you dress so funny in school? By the time I was 12 I had to earn my own money, my parents bought shoes and jackets. We had to pay for college too…. First, thank you for reading and commenting on “Sugar.” He fits in like he was born to be in our family. Even Honey loves him now! Now, to this wonderful post – I can so relate to being young and experiencing wardrobe hell. My grandmother made most of my clothes, and like your mother, she was a fine seamstress. However, she and my mother steadfastly refused to let me wear the latest styles. They contended that I would have plenty of time to be a teenager when I was actually a teenager. I don’t remember being ridiculed, but I do remember feeling that I was outside of a magic circle which enclosed and guarded the girls who had “It.” As you might have noticed in my post on friendship, it has never been easy for me to fit and and make friends. Instead, I had one BFF, and we practically lived together. I had no sisters, so she filled that need in me. Our friendship lasted until she died in 1996, no matter what I wore. 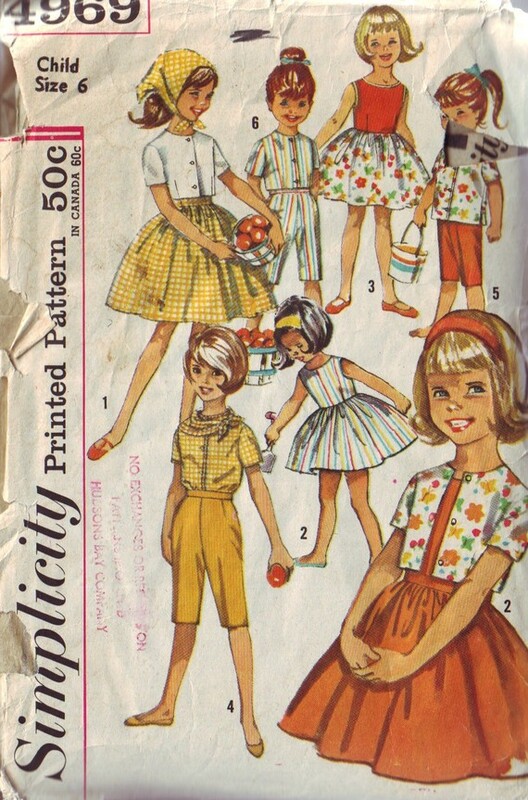 It’s such a hoot to see the pictures of those patterns – what memories those bring back. I had similar feelings at seven, although I was the oldest and only girl – it seemed like wearing the right clothes was the secret to happiness and coolness. As always, a delightful story to read. This is such a sweet story on so many levels. You not wanting to hurt your mother’s feelings. Your mother re-vamping your dress. God bless her. Moms are so anticipatory, aren’t they? They anticipate our needs, our hearts, our feelings, so often without a word from us. And the pattern images – I love them. That first one that was so out of date in 1964? Adorable. It’s funny how fashion can make such a difference peer wise. I went to Catholic schools and had to wear uniforms – but I certainly dealt with my own fashion faux pas once I entered a public high school. And I was 7 in 1964 too – and had an older sister who held just as much mystique to me – ditto to the Beatles records and her record player. I can still see it – like a little suitcase that closed and latched on itself. Funny….